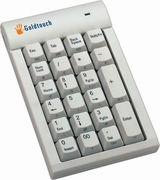 The Goldtouch USB Numeric Keypad Hub product is the latest in our line of ergonomic peripherals that are designed to enhance your productivity and comfort. The USB Numeric Keypad Hub allows you to do all your calculations from the keypad; there is no longer the need to tediously use your mouse to select these functions, or worse still, to use your calculator to do your work and then have to re-enter the values manually. Errors are reduced, and efficiency is enhanced. -The inclusion of a 00 will help your efficiency in many applications when working with dollars and cents.